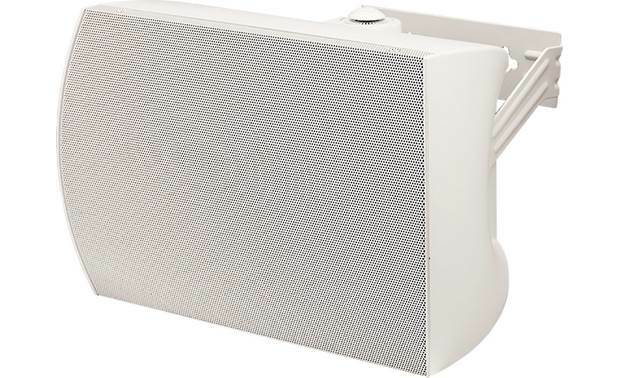 The SoundTube SM52-EZ is a weather-resistant speaker that can be mounted horizontally or vertically, indoors or out. It features a 5-1/4" woofer and 1" soft dome tweeter that make sure customers hear music and important announcements. Overview: The Soundtube SM52-EZ is a commercial 25/70/100 volt surface mount speaker featuring a 5.25" coaxial driver mounted in a ported enclosure. 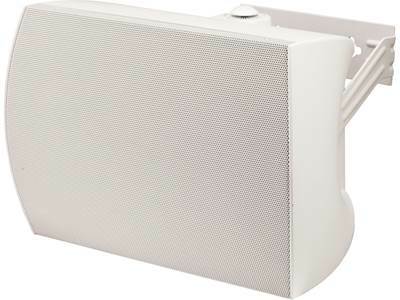 Designed for both indoor and damp outdoor applications, the speaker features a full frequency dispersion pattern and a high sensitivity, making it ideal for music and paging in retail, amusement parks, airports, hotels, schools, and many applications. Two-Way Driver Design: The SM52-EZ features a 5.25" woofer, with polypropylene cone and butyl rubber surround, with a coaxially mounted 1" soft dome tweeter. Utilizing Soundtube's BroadBeam Ring technology, the speaker offers increased midrange clarity and ultra wide off axis performance, up to 10 kHz, for maximum coverage area per speaker. Enclosure: Available in black or white, the speaker is housed in a durable high impact polystyrene enclosure with a powder-coated aluminum grill. A back plate and conduit connector help protect the input terminal strip and tap dial from dust and moisture. The enclosure comes ported, but can be sealed with the included rubber port plug after removing the front grill. The speaker is IP65 rated for high dust and water resistance when the included port plug is installed. Terminal Strip: A 4-position ceramic terminal strip is provided for wiring connections. One set of terminals provides the signal input while the other set provides a pass-thru for daisy-chaining multiple speakers. Each terminal can accommodate speaker wire up to 12 gauge in size and includes a set-screw to hold the wire firmly in place. Mounting Bracket: The included heavy-gauge U-style mounting bracket offers great placement flexibility. It allows you to rotate the speaker almost 180° after mounting, letting you direct the sound as needed. If the speaker is mounted vertically, the bracket allows it to swivel side to side. If the speaker is mounted horizontally, the bracket allows it to swivel up and down. The speaker's shape makes corner placement easy. Once positioned, the speaker can be locked down at the desired angle with the included U-bracket screws and screw caps. A 10" safety cable is provided that attaches to the speaker enclosure on one end and the U-bracket on the other end. Dimensions: Width - 7.625", Height - 12.0", Depth - 6.625"
Searches related to the SoundTube SM52-EZ 5-1/4" commercial weather-resistant surface mount speaker.